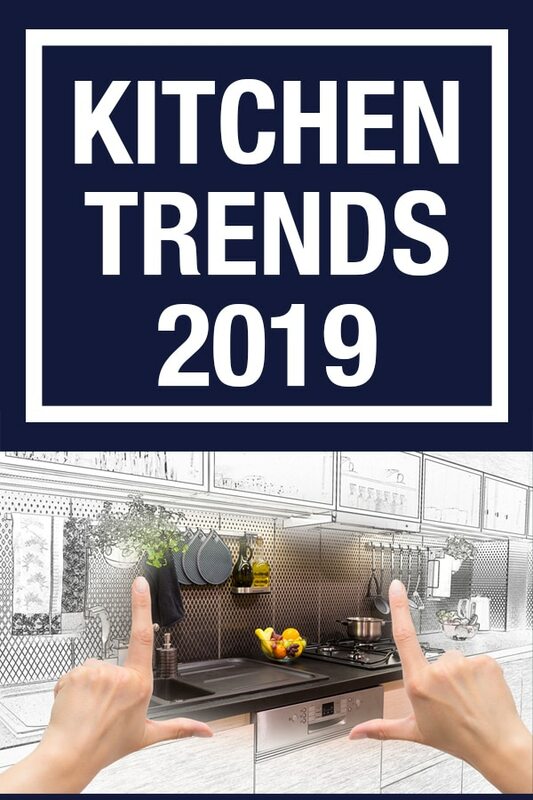 Don’t miss the kitchen trends 2019 if you are planning a kitchen renovation or you’re building a new home. 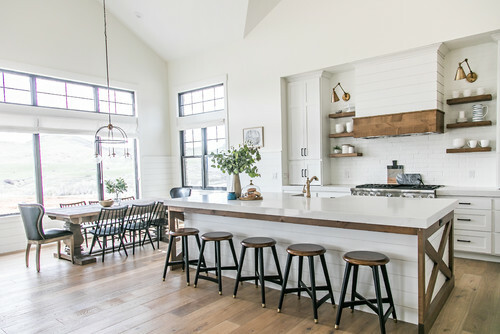 While farmhouse kitchens continue to be popular, there are a few kitchen trends that are taking over 2019. 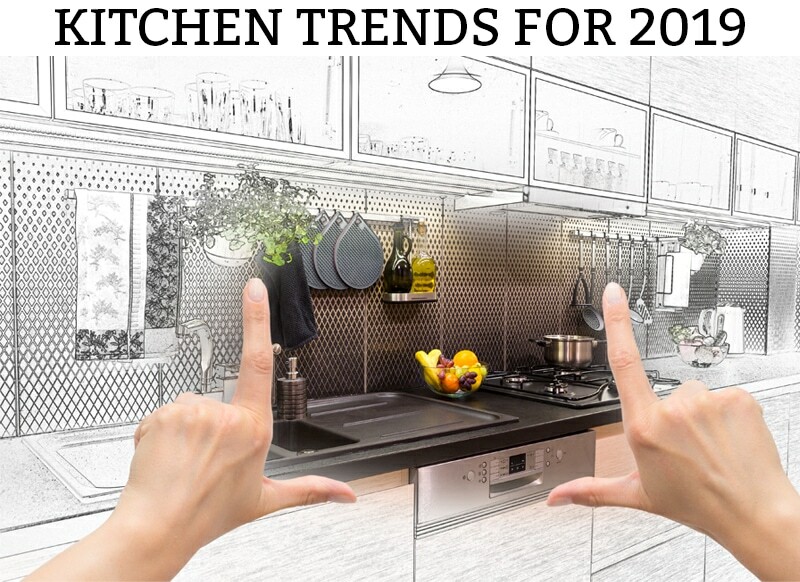 Here are the kitchen trends I think we’ll see this year. Brass, gold, old gold, antiqued brass, no matter what you call it, it’s back and it’s big. This trend isn’t leaving anytime soon. 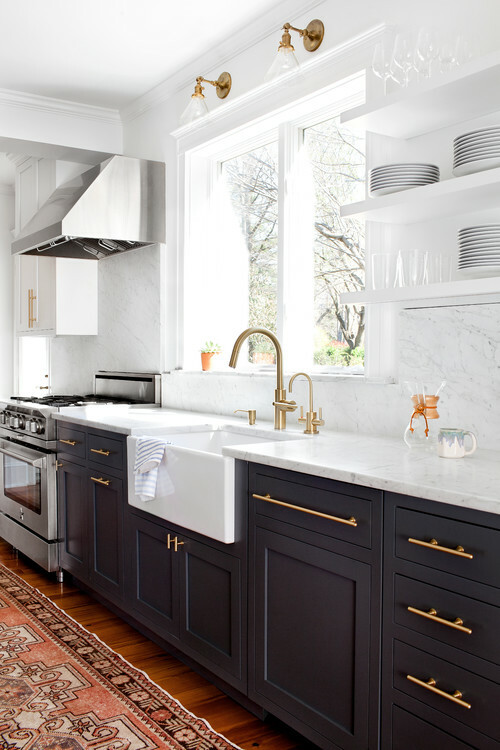 Be prepared for more brass lighting, faucets, and hardware. 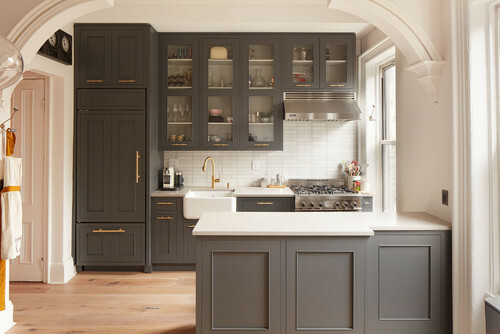 Cabinets in a very dark gray color or black are gaining popularity. These deep hues provide a beautiful contrast to the ever-so-popular white countertops. It creates a richness that white just can’t provide. It’s particularly great in a space full of windows and high ceilings. 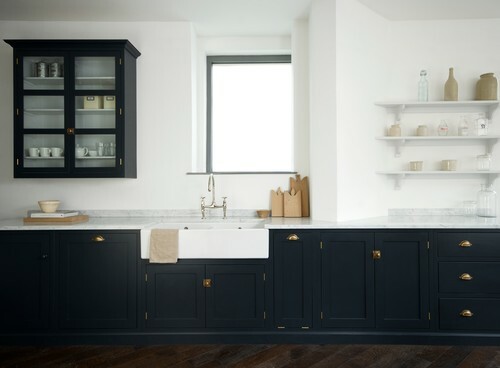 Open shelving (and also glass cabinets) continues to be popular in 2019. Kitchens used to be all about getting as much storage as possible (which meant covering every inch in cabinetry. 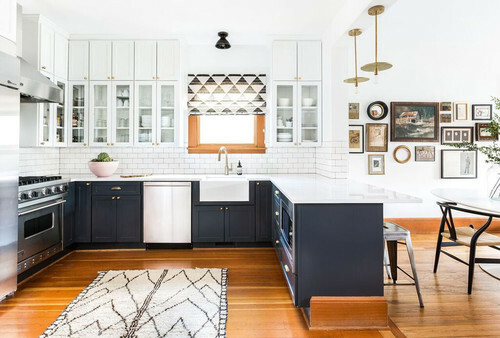 Now, homeowners are opting to bring a little more softness to their kitchen by adding some open shelves or glass cabinets that provide an opportunity to showcase decor. Plus, the shelving helps to break up the space. 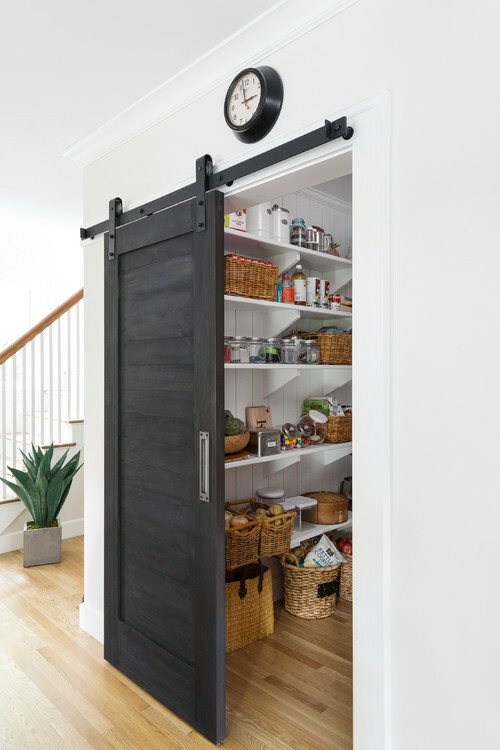 Large pantries are a homeowner favorite. Because we’re opting to open up our kitchens by having fewer cabinets (think more windows, open shelves, large hoods surrounded by tile, etc). we need to find a place for all of that kitchen stuff to go. Plus, with Instapots, Air Fryers, Multiple Mixers, and more cluttering up our counters, we’re all dying to find space to house it all. 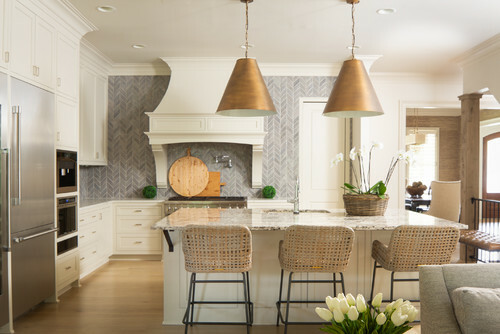 This year, you’re going to continue to see a patterned tile for both backsplashes and flooring. 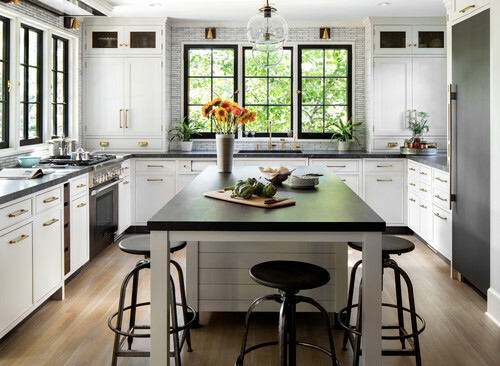 Softer distressed patterns, big bold patterns, black and white, colorful, are making a statement in kitchens. I wish I had a place to put wall sconces in my kitchen. They’re popping up everywhere. 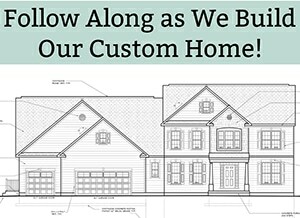 Over sinks, above windows, over shelves, doors, and more. I am not sure if they bring a ton of functionality but man are they cute (I know, how can a light be cute? These little things definitely are). Mixing finishes is the new norm. Gone are the days of needing to match every metal in the room. 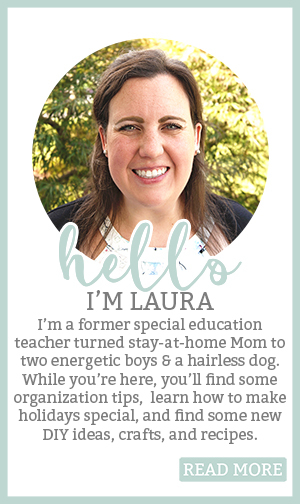 People are opting for a more casual, eclectic look. Expect to see people using 2-3 (or more!) finishes in one room. 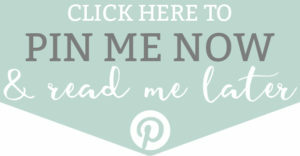 If you want a great example, click on the picture above to see the rest of this kitchen. Kitchens for a while were a little uptight and stuffy. 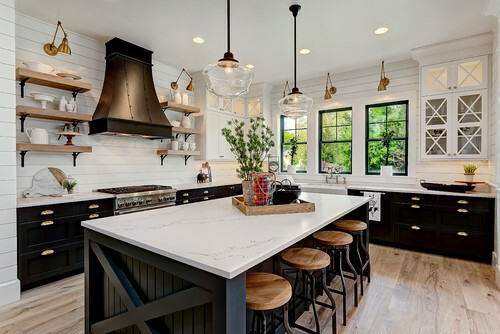 Now, kitchens are full of various textures, metals, colors, mixes of cabinets, basket storage, open shelves on islands, rustic islands from old furniture, etc. They’re becoming way more casual in their style. 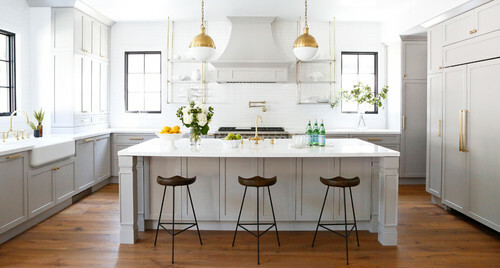 Kitchens are the heart of the home and this year, they’re becoming homier. 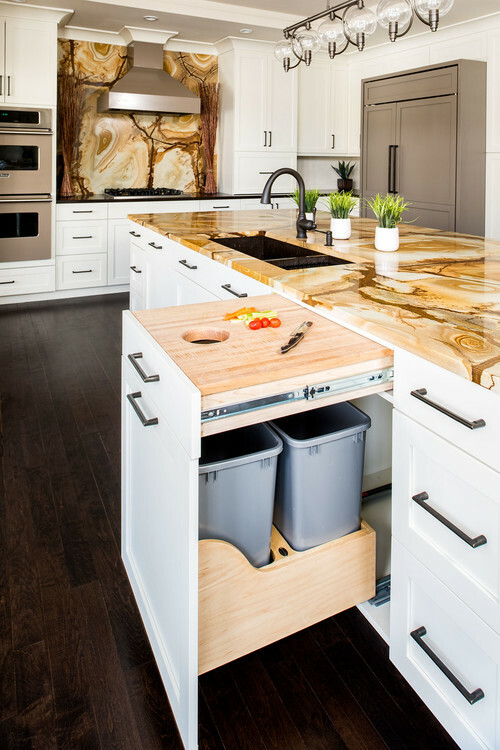 Paper towel drawers, hidden cutting boards, trash can centers with trash bag storage, fancy pull-out drawers, and more are hitting the cabinet-maker company’s shelves. The innovation in cabinetry storage solutions is incredible. 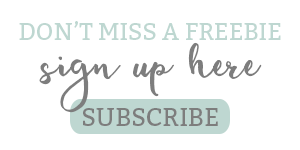 Some of those options have now become more mainstream so expect to continue to see more of them as time goes on. 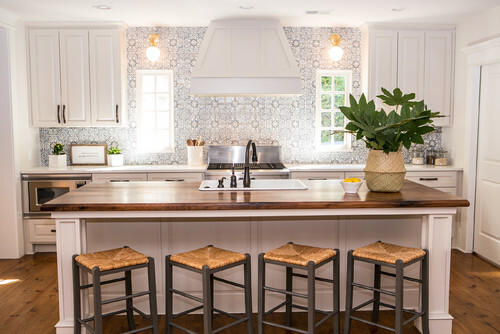 Using pulls in place of knobs, using more than one type of pull in a kitchen, and mixing and matching their finishes. Oversized lighting (particularly above an island) is gaining popularity. Days of three mini-pendants hanging above the island are gone. And if you do see mini-pendants, they often hang in groups of 5 or more. Drawers in place of standard base cabinets are popping up everywhere. In times past, home owners would install pull out shelving for their cabinets. Why deal with a bulky cabinet door when you can just pull a drawer open? Open-living continues to be popular in 2019. When searching for house plans, many of the plans I came across had no dining room or had a flex-room that could be used as you pleased. People are choosing to live more simply by doing away with the separate dining room. We’ve all seen a kitchen with a different color island or different color base cabinets from the uppers. 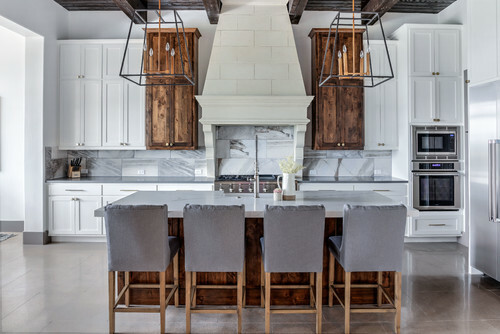 The trend of 2019 is varying cabinet colors spread throughout the entire kitchen. Often times, they are still placed so they are balanced within the kitchen (such as the image above).